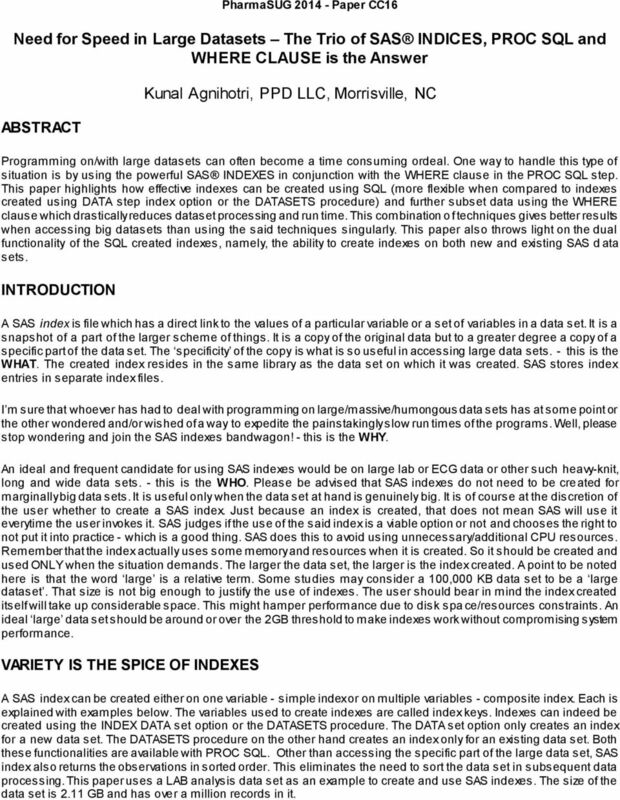 Download "Need for Speed in Large Datasets The Trio of SAS INDICES, PROC SQL and WHERE CLAUSE is the Answer, continued"
1 PharmaSUG Paper CC16 Need for Speed in Large Datasets The Trio of SAS INDICES, PROC SQL and WHERE CLAUSE is the Answer ABSTRACT Kunal Agnihotri, PPD LLC, Morrisville, NC Programming on/with large datasets can often become a time consuming ordeal. One way to handle this type of situation is by using the powerful SAS INDEXES in conjunction with the WHERE clause in the PROC SQL step. 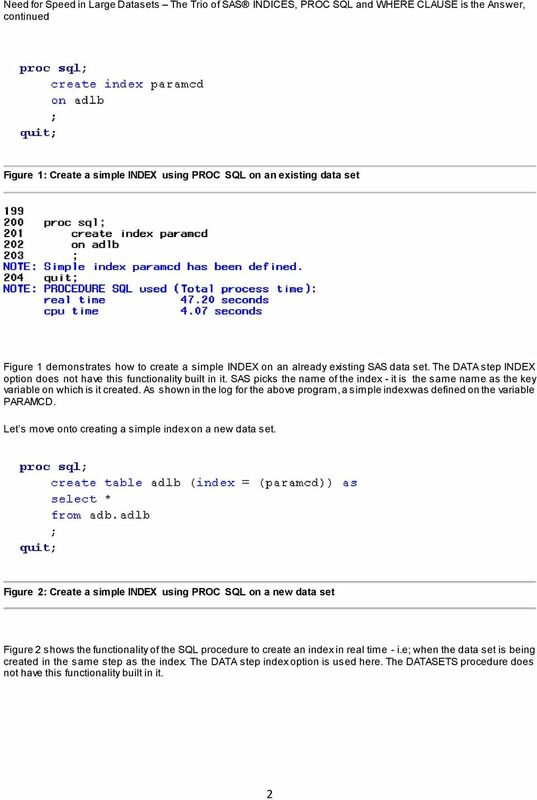 This paper highlights how effective indexes can be created using SQL (more flexible when compared to indexes created using DATA step index option or the DATASETS procedure) and further subset data using the WHERE clause which drastically reduces dataset processing and run time. This combination o f techniques gives better results when accessing big datasets than using the said techniques singularly. This paper also throws light on the dual functionality of the SQL created indexes, namely, the ability to create indexes on both new and existing SAS d ata sets. INTRODUCTION A SAS index is file which has a direct link to the values of a particular variable or a set of variables in a data set. It is a snapshot of a part of the larger scheme of things. It is a copy of the original data but to a greater degree a copy of a specific part of the data set. The specificity of the copy is what is so useful in accessing large data sets. - this is the WHAT. The created index resides in the same library as the data set on which it was created. SAS stores index entries in separate index files. I m sure that whoever has had to deal with programming on large/massive/humongous data sets has at some point or the other wondered and/or wished of a way to expedite the painstakingly slow run times of the programs. Well, please stop wondering and join the SAS indexes bandwagon! - this is the WHY. An ideal and frequent candidate for using SAS indexes would be on large lab or ECG data or other such heavy-knit, long and wide data sets. - this is the WHO. 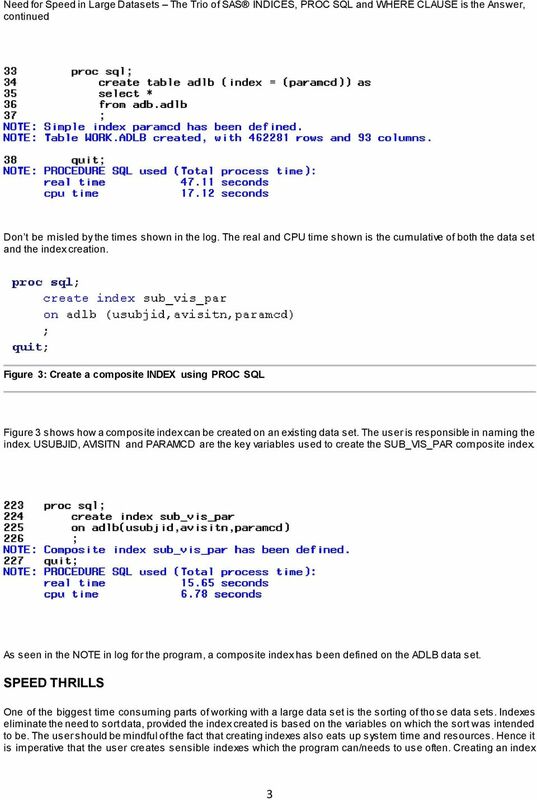 Please be advised that SAS indexes do not need to be created for marginally big data sets. It is useful only when the data set at hand is genuinely big. 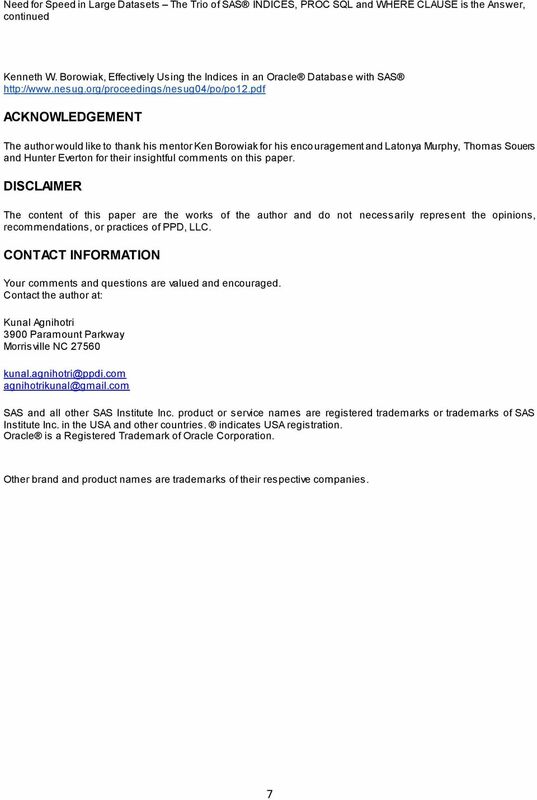 It is of course at the discretion of the user whether to create a SAS index. Just because an index is created, that does not mean SAS will use it everytime the user invokes it. SAS judges if the use of the said index is a viable option or not and chooses the right to not put it into practice - which is a good thing. 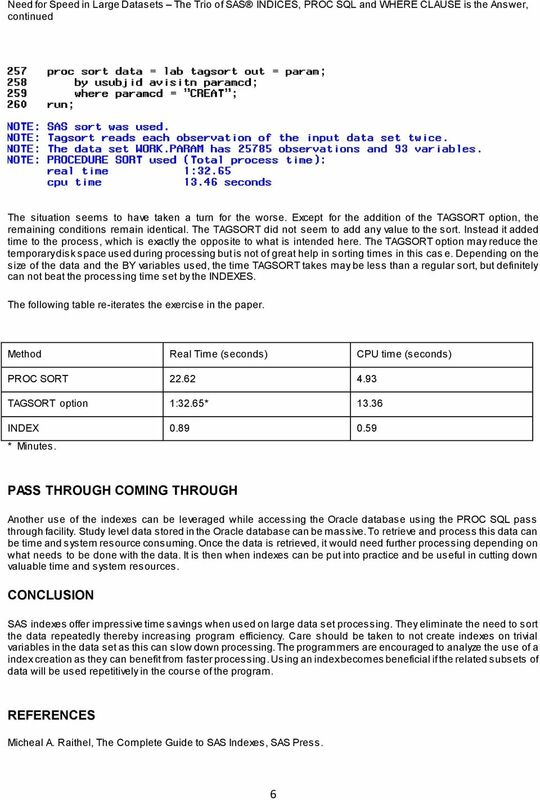 SAS does this to avoid using unnecessary/additional CPU resources. Remember that the index actually uses some memory and resources when it is created. So it should be created and used ONLY when the situation demands. The larger the data set, the larger is the index created. A point to be noted here is that the word large is a relative term. Some studies may consider a 100,000 KB data set to be a large dataset. That size is not big enough to justify the use of indexes. The user should bear in mind the index created itself will take up considerable space. This might hamper performance due to disk spa ce/resources constraints. An ideal large data set should be around or over the 2GB threshold to make indexes work without compromising system performance. VARIETY IS THE SPICE OF INDEXES A SAS index can be created either on one variable - simple index or on multiple variables - composite index. Each is explained with examples below. The variables used to create indexes are called index keys. Indexes can indeed be created using the INDEX DATA set option or the DATASETS procedure. The DATA set option only creates an index for a new data set. The DATASETS procedure on the other hand creates an index only for an existing data set. 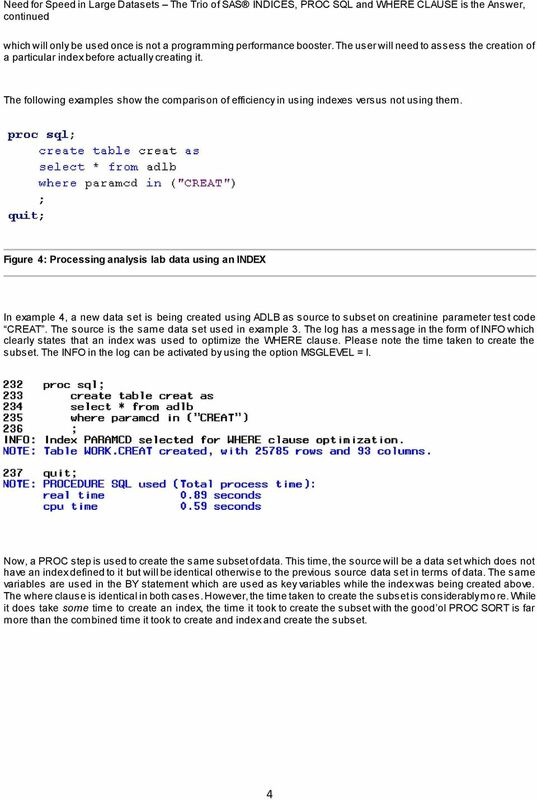 Both these functionalities are available with PROC SQL. Other than accessing the specific part of the large data set, SAS index also returns the observations in sorted order. This eliminates the need to sort the data set in subsequent data processing. 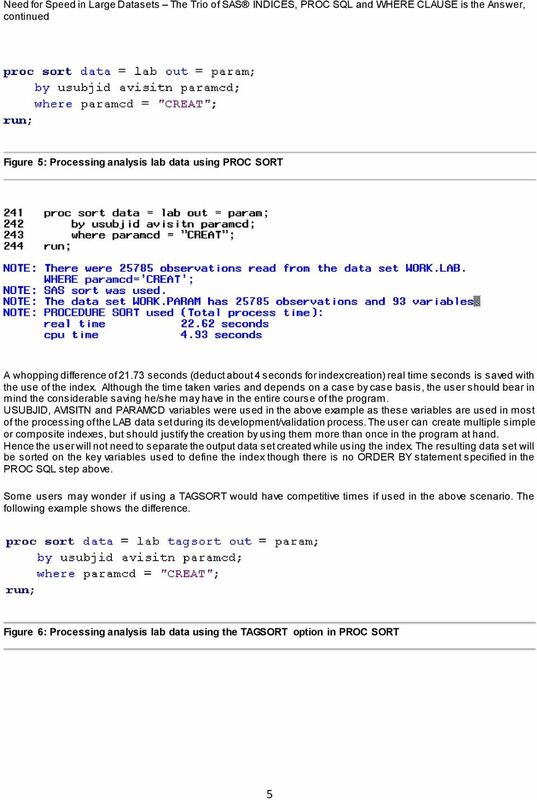 This paper uses a LAB analysis data set as an example to create and use SAS indexes. The size of the data set is 2.11 GB and has over a million records in it. ABSTRACT PharmaSUG 2012 - Paper CC07 Importing Excel File using Microsoft Access in SAS Ajay Gupta, PPD Inc, Morrisville, NC In Pharmaceuticals/CRO industries, Excel files are widely use for data storage. It s not the Yellow Brick Road but the SAS PC FILES SERVER will take you Down the LIBNAME PATH= to Using the 64-Bit Excel Workbooks. Figure 1. Example of an Excellent File Directory Structure for Storing SAS Code Which is Easy to Backup. TU04 Best practices for implementing a BI strategy with SAS Mike Vanderlinden, COMSYS IT Partners, Portage, MI ABSTRACT Implementing a Business Intelligence strategy can be a daunting and challenging task. The MAX5 Advantage: Clients Benefit running Microsoft SQL Server Data Warehouse (Workloads) on IBM BladeCenter HX5 with IBM MAX5.